Happy 90th to the Grand Ole Opry! On 28 November 1925 a white-bearded man sat down before one of the Nashville radio station WSM’s modern carbon microphones to play some old-time fiddle tunes. Uncle Jimmy Thompson played on the air for an hour that night, and throughout the region listeners took notice. In Nashville the response at the offices of National Life and Accident Insurance Company, which owned radio station WSM, was dramatic. It was not long before the station manager was besieged by pickers and fiddlers of every variety, all wanting their shot at the Saturday night airwaves. 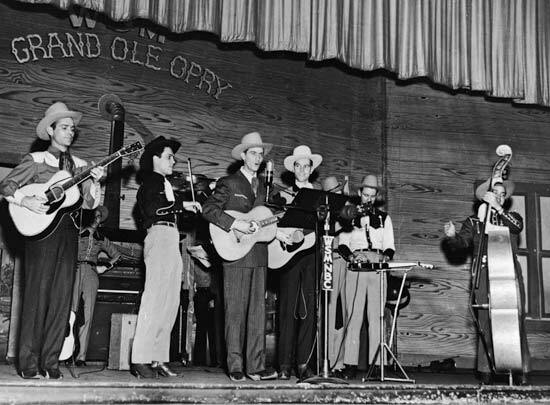 By 1940 the Grand Ole Opry had found its national audience and was poised to become the legendary institution that it remains to this day. This according to A good-natured riot: The birth of the Grand Ole Opry by Charles K. Wolfe (Nashville: Country Music Foundation, 1999). Above, Ernest Tubb at the Opry. Below, Roy Acuff offers his imitation of a train whistle. Comments Off on Happy 90th to the Grand Ole Opry!